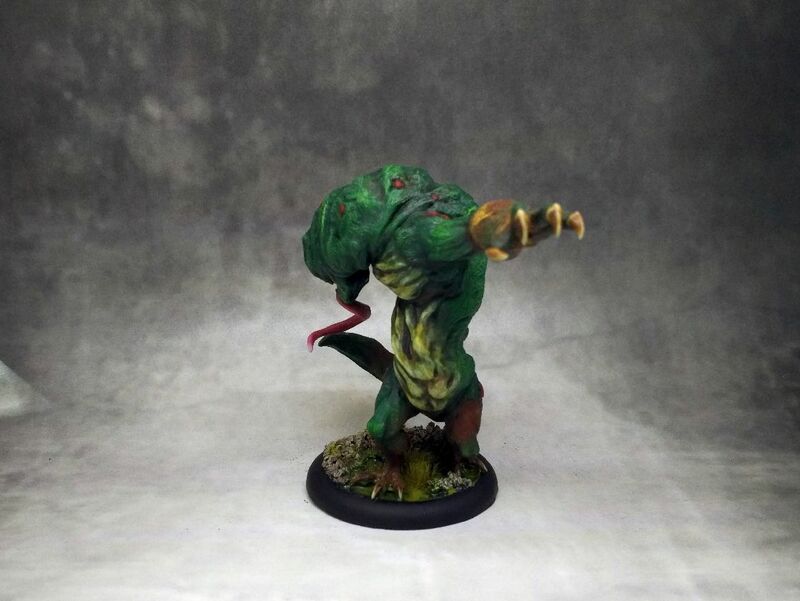 With Wave 5 of Malifaux models Wyrd has reached into African folklore for more inspiration. Grootslang is an Afrikaans word that means great snake. Legend has it that this primeval monster was too powerful and the gods were forced to divide it into two separate species; the elephant and the snake. Despite these drastic measures, some creatures managed to escape and hid in deep caves. These creatures can be up to 60 feet long and it is believed they lure victims to their lairs by filling them with diamonds. I like the way Wyrd expands their universe and includes these kind of tales in Malifaux. It feels better to work on a model that has interesting background story, rather than just another big monster. Grootslang is a huge model. 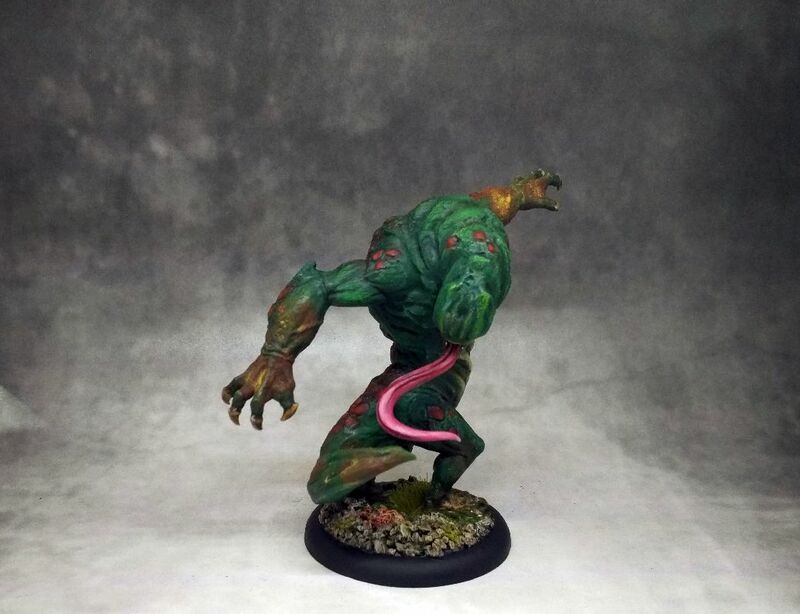 It towers over any other miniature in my collection, which is not what you would expect from a 6ss minion. The sculpt exudes raw power and... not much else. It actually reminds me of a Cave Troll from The Lord of the Rings GW range. I'd like it to be more unusual, perhaps if it walked on all four limbs it might be more interesting. Somehow I was put off painting it as I had hard time deciding how to approach it. I've seen him painted as Venom from Marvel universe but I'm not a fan of these comics so the idea didn't appeal to me. 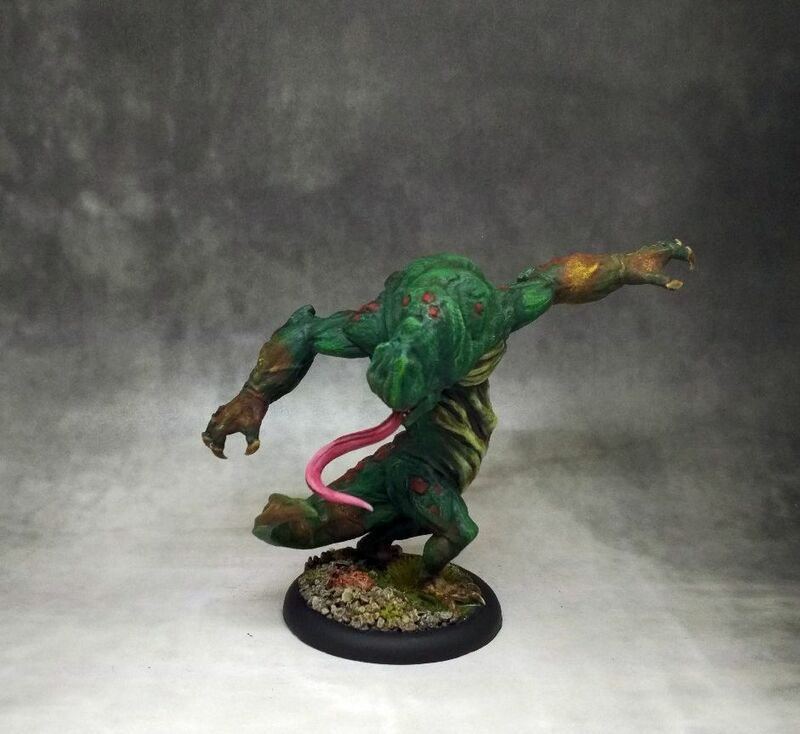 In the end I chose more natural look that will go well with the rest of my swamp-themed Neverborn. 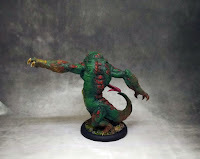 I looked at some pictures of frogs and lizards and decided to use bright, muddy look on Grootslang's belly to add some contrast to his green skin. 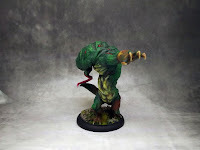 I was going back and forth with various highlights and glazes and in the end left his skin dark green. Prior to painting I filled the gaps using thick plastic glue and applied GW's Typhus Corrosion on some of the flat areas to add extra texture there. 6ss is a erlatively low cost and the model seems to have at least a few interesting options to bring to the game (I've yet to try him). At the beginning of the game he places three 50 mm Lair markers on your side of the table and can later move back and forth between them. Grootslang can also place more such markers after eating Corpse or Scrap markers. He ignores penalties for severe terrain and is immune to hazardous terrain. He has two Ml5 actions but can easily get a + to the attack flip. His Wp and Df are a low 5 and 7 wounds won't carry him far so in terms of survivability he epitomizes the essence of old Neverborn playstyle (hit them quick and move to cover). Ależ paskudne bydle! Fajnie pomalowałeś mu brzuszysko. 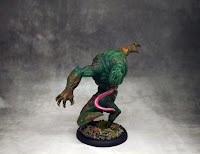 Przy tej formie rozrywki i świata jaki jest w Malifaux to Wyrdowi nie szybko skończą się pomysły na potworki. Twoja praca wyśmienita!